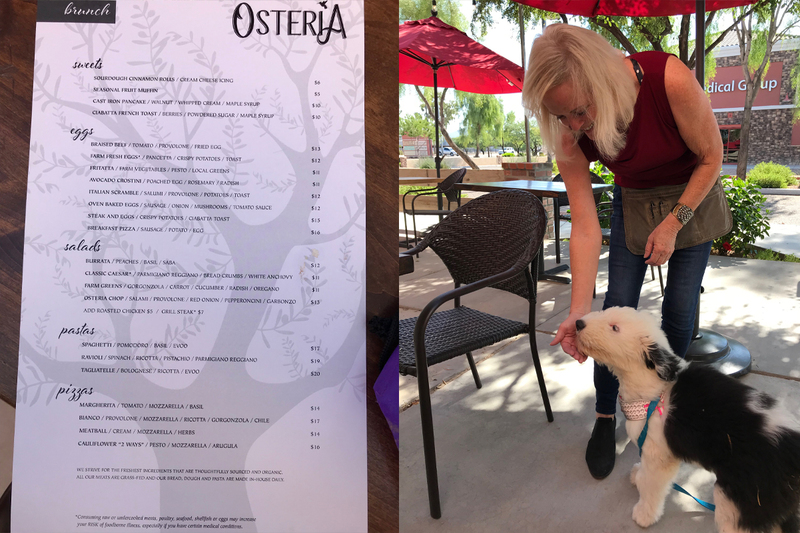 We will be blogging on different dog-friendly restaurants in the Mesa, Gilbert, and Chandler area over the next few months, until we have tried them all! We post our schedule on our website under Calendar of Events if you want to see where we’ve been and where we’re going next. Osteria is a relatively new restaurant in Mesa. It opened in February 2018. Living in Alta Mesa, we drive by the restaurant several times a week. 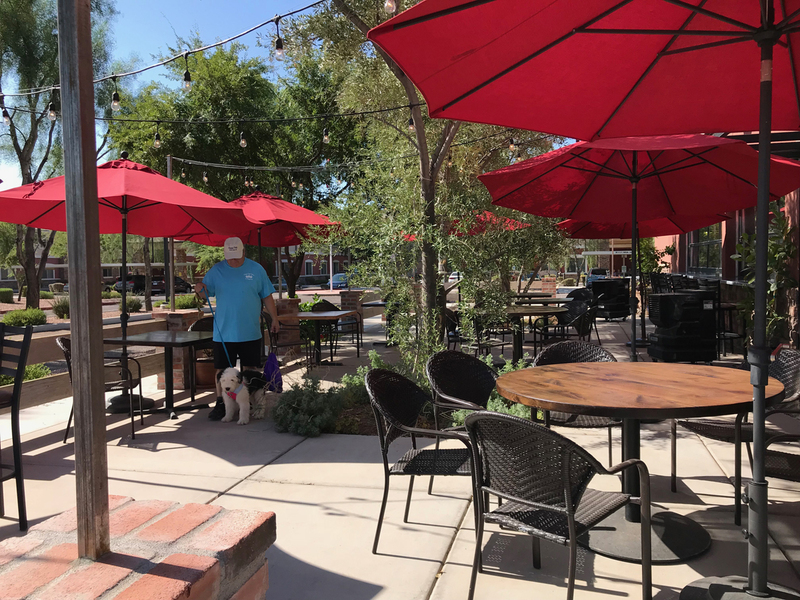 Osteria is located on McKellips Road, between Higley and Recker, in the same complex as the new Uptown Jungle Fun Park. It is always refreshing to find restaurants with patios who offer breakfast because when dining with our dogs the first part of the day is the coolest. It is a treat for our dog to go with us. They feel special. Dogs love to be part of the action instead of staying home. By taking your dog with you first thing in the morning you don’t have to see their sad eyes if you’re leaving without them. We all know that look and those eyes. Just a couple hours of time with them in the morning and they will be satisfied for the next six hours. 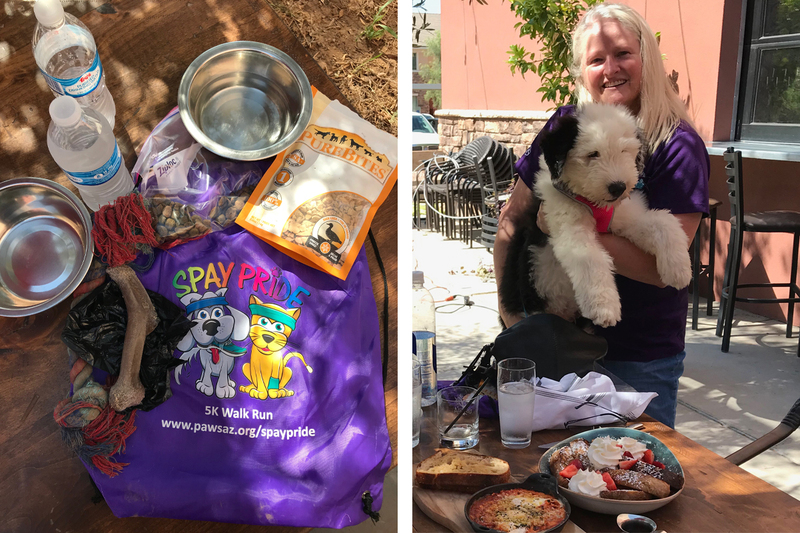 Wrigley, our Old English Sheepdog puppy went with to experience the patio dining from a dog’s perspective. Wrigley is one day shy of being 12-weeks old, which is like taking a 3-year old toddler out to eat. With a puppy so young and inexperienced, the focus of the meal usually tends to be more about monitoring the baby, and that was pretty much how our breakfast went. Fortunately for us, the patio at Osteria is very open and spacious. There is plenty of room in-between tables. The really cool thing about their patio is the live, planted in the ground trees. Not only do they offer shade, the accessible cool damp ground is a great spot for Wrigley to lay down out of the pathway of servers and other guests. Plus, there is something about how real trees make you feel more connected to nature. The trees give this patio a really enjoyable outdoorsy atmosphere. We were greeted immediately on the patio by Sherrie, our server. She was very quick to see we had brought a puppy, and she offered him love. Kindness and attention always warm a dog parent’s heart! We arrived at 9 am. Sherrie made sure we had a nice table in the shade. She let us know she would bring Wrigley a water bowl, and then she asked what we wanted to drink. She has her priorities in the right order. Cater to the dog first, and then you easily win over the pet parents. Yep! It is a small detail for a server to do, but huge in a dog-parent’s mind. We had brought Wrigley’s bowls with us so we didn’t need any from the restaurant. But still nice for people to know if they are driving by and stop in and don’t have a water bowl that one will be provided. That sounds simple but think about it…dogs drinking or eating out of restaurant dishes…. no thank you. So, it is nice when restaurants are prepared and have special separate bowls for canine customers. 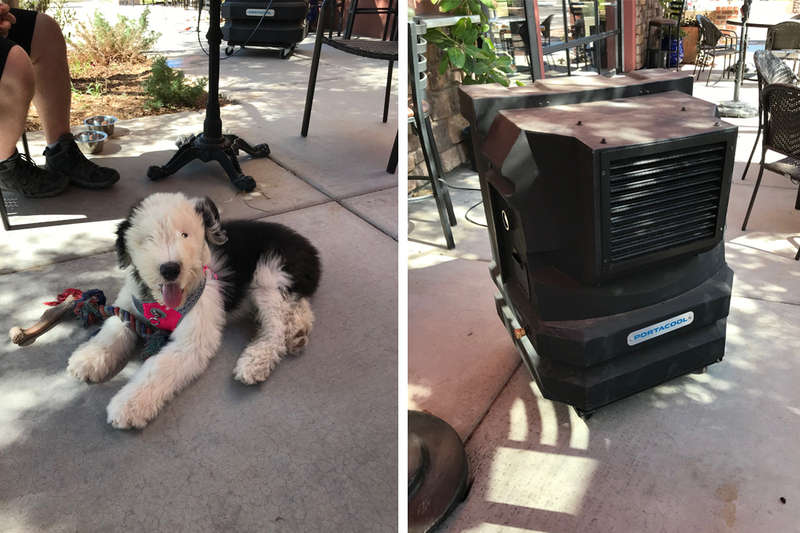 Sherrie turned on the two portable evaporative cooler units to blow air directly on us so that little Wrigley could stay cooler. Evap coolers lower temperatures on average by 20-degrees. It cools using the contained tap water from a garden hose. Pretty simple and effective. The patio does not have misters installed (yet) but I guess that is on their list of things to do. When you own your own business, the list of things to do is always on your mind, but only so much can get done in a month. We understand that. Wrigley didn’t care that there weren’t misters. He thoroughly enjoyed the strong wind currents from the evap coolers. It was fun to watch his fur blow in the wind. In my opinion, the evap coolers were more fun for Wrigley, definitely made great videos, and probably just as effective as misters. Looking at the brunch menu, some of the choices for a dog could include steak and eggs, or the farm fresh eggs. There is also roasted chicken which is probably pretty tasty. We brought Wrigley’s kibble and his food bowl so he could eat with us. This was Wrigley’s second dining experience. His first experience was two weeks prior when he was 10-weeks old. The difference on this visit, is that today he smelled the delicious food and kept wanting to see for himself what was on the table. And he is taller now so there were a couple times he surprised me by his head reaching the table’s height. Thankfully, Wrigley starts his AKC S.T.A.R. 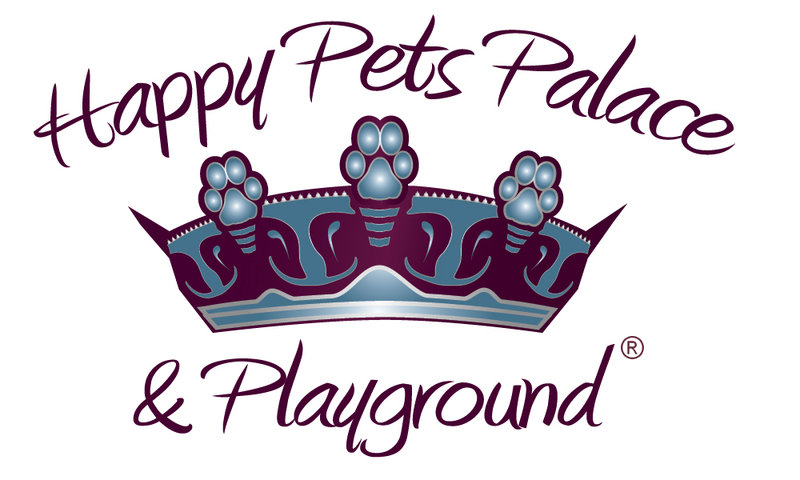 Puppy Training program at Happy Pet Palace next week. Our goal is that he can be a good puppy and continue to join us on pet dining outings even when he weighs well over 50-pounds. My hubby, Albert and I ordered Zeppole as an appetizer. They are like donut holes rolled in cinnamon sugar. It was obvious they were freshly made and pipping hot on the inside which made the butter melt into the dough when cut in half. The Zeppole is offered on the breakfast menu. 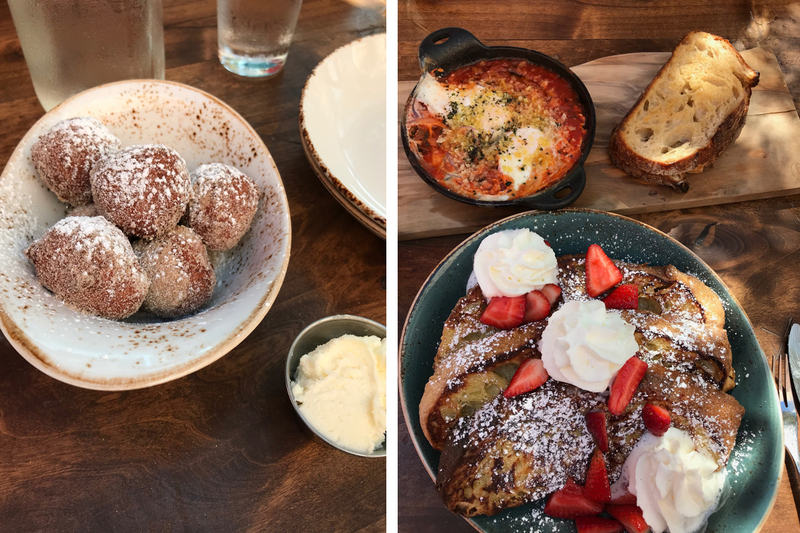 Albert had oven baked eggs and I had the Ciabatta French toast with strawberries. The French toast portion could have fed two people especially after having the delicious appetizer, none of which was wasted. Albert did mention their orange juice was the best he has ever had. He said it tasted freshly squeezed, that it was very refreshing and not too sweet. Dog kibble, half of Wrigley’s lunch. He’s still a puppy with sensitive tummy. Hindsight, what would have made this pet dining experience better would have been for us to arrive earlier even by just one hour would have been cooler for all of us. This patio gets the morning sun with its eastern exposure. There is plenty of shade from the trees and several umbrellas, so we were OK, but a little warm. It would also have been a great idea to have packed a frozen yogurt/peanut butter Kong for Wrigley to have been entertained for another 15 minutes while we ate. And lastly, to make our experiences better we need to get Wrigley enrolled in training while he is still a puppy. He needs to learn manners and what is appropriate behavior. So, his puppy training starts August 6th at Happy Pets Palace. As with all our pet-dining experiences we comment on the bathrooms because you might need to use one. The bathrooms are located inside pretty close to the patio, but you can’t take your dog inside unless they are a true service dog. Be sure to plan ahead if dining with just your pet. Or if you have a friend with you, then your bathroom problem is solved. Check out our future dates on our Calendar of Events. Note: We are encouraging taking regular non-service dogs to patio dine at dog-friendly restaurants because it can be a nice social experience. The blogs about our dog-friendly restaurant visits are not about service dogs. We respect the training service dogs have gone through to provide a valuable and necessary service(s) to their human.